Check out what’s Tax Free during the Alabama Back To School Tax Free Weekend 2019. This is information is unofficial and based on 2019 data. 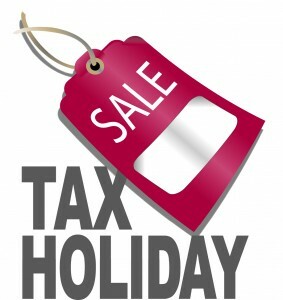 Alabama Sales Tax Holiday 2019 for school-related items begins at 12:01 a.m. Friday, July 19th, 2019, and ends at midnight Sunday July 21st, 2019, giving shoppers the opportunity to purchase certain school supplies, computers, books and clothing free of the state’s four percent sales or use tax. Cities and counties must notify the Alabama Department of Revenue by July 7th if they intend to also waive their taxes during the three-day tax holiday. A record 291 localities added their tax savings to the statewide holiday in 2019: 233 municipalities and 58 counties. Alabama Free Tax Weekend Back to School 2019. (xi) wigs and hair pieces. (xii) welders gloves and masks. intended primarily for recreational use, or video games of a non-educational nature. will not qualify for the exemption. a “computer” or automatic data processing equipment to perform a task. 5. Printer supplies for computers; printer paper, printer ink. more than thirty dollars ($30) and less than fifty dollars ($50). offered for sale in a non-bound form. item of clothing selling for more than $100.00. to sell each shoe for $100.00 to qualify for the exemption. item) would not qualify for the exemption. the items may not be averaged in order to qualify for the exemption. actual sales price of the jeans is $99.00. (its price is over $100.00) and the shirt is exempt (its price is less than $100.00). purchase because the dealer’s actual sales price to the customer is $750.00. computer with a sales price of $850.00, the exemption would not apply. not apply because the sales price is in excess of $100.00. the total sales price of the newly purchased item. (c) A customer purchases a covered item before the exemption period. not qualify for the exemption. is actually purchased after the exemption period. the exemption period qualify for the exemption. order for the item to qualify for the exemption. provide documentation that shows that sales tax was paid on returned merchandise. which the seller will accept returns. located in one time zone and a seller is located in another. sales price of all items and, if applicable, any tax charged. be reported as currently required by law. allocated to each item ordered, and separately identified on the invoice. Listed below are the counties and municipalities that have notified the Department of their decision to participate or not participate in the Alabama “Back-to-School” Sales Tax Holiday. Please note that some counties and municipalities may adopted the “Back-to-School” Sales Tax Holiday for the current year (2017) only and some localities have adopted the “Back-to-School” Sales Tax Holiday on a “limited” basis, whereby only a portion of the locality’s total sales and use tax levy is exempted. Localities that do not levy a sales tax are not listed.